Information & Facts about the 1956 Cecil B. DeMille movie "The Ten Commandments"
What's facts and what's fiction? What was the connection between Moses and the Pharaohs Seti I and Ramses the Great? The 1956 Cecil B. DeMille movie "The Ten Commandments"
Anyone who has seen the 1956 Cecil B. DeMille movie "The Ten Commandments" starring Charlton Heston as Moses, Yul Brynner as Ramses II and Cedric Hardwicke as Seti will try to relate the story to fact. However, the movie takes some facts with some fiction and mixes them together to arrive at the story depicted in the film. Which confuses the life out of anyone who is studying Ancient Egyptian history! Who were the Pharaohs Seti I and Ramses the Great? "The Ten Commandments" movie portrays the Ancient Egyptian Pharaohs Seti I and Ramses II, also known as Ramses the Great. Fact or Fiction? 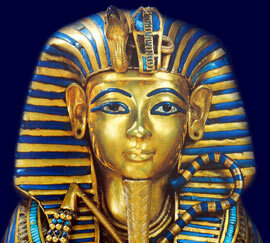 These two Pharaohs featured strongly in the movie "The Ten Commandments"
Who was Moses? What elements of this story relate to Egyptian facts and the myths from Ancient Egyptian religion? No person fits this situation in the royal court of Seti. However, there was a Prince Tuthmose, the eldest son of pharaoh Amenhotep III, who mysteriously disappears from all records. Could he have been the factual origin of the Biblical character Moses? The religion of Ancient Egypt was a polytheistic religion (with many gods). There was just one short period of monotheism (the worship of one god), during the reign of Akhenaten - who became known as the Heretic Pharaoh. In the "The Ten Commandments" movie Moses is portrayed as the son of the sister of the Pharaoh Seti who was found in the bulrushes. The Egyptian Ipuwer papyrus, which dates back to the much earlier Old Kingdom period, describes a series of calamities befalling Egypt, including a river turned to blood. Could this document be interpreted as an Egyptian account of the Plagues of Egypt? The Ten Commandments are given to Moses by God. The answer to the question who was Moses is clearly open to speculation, but never the less, an extremely interesting subject to debate. Each section of this Ancient Egyptian website addresses all topics and provides interesting facts and information about the Golden Age of Pharaohs and of Moses, Ramses and Seti. The Sitemap provides full details of all of the information and facts provided about the fascinating subject of the Ancient Egyptian Kings - their life, family, reign, dynasty, important dates and events and accomplishments.